What's an Effective Dry Scalp Treatment for a Shaved Head? What’s an Effective Dry Scalp Treatment for a Shaved Head? » What’s an Effective Dry Scalp Treatment for a Shaved Head? Dry scalp treatments are often sought after by people who have shaved heads or are naturally bald. It seems that you are more likely to suffer from a dry and itchy scalp if you don’t have any hair. After all, you have less protection from bad weather, pollutants, chemicals, and allergens. There are many ways to care for a dry scalp if you have a shaved head. They range from using specialist shampoos to applying specialist lotions and exfoliating. You just want to look after the skin and keep it in optimum condition. When you are bald or have a shaved head, you are less protected from the elements. This can make you more susceptible to a dry scalp (although there are many different causes). For this reason, you are likely to want to treat yourself and look after your scalp. What Are the Top Treatments for a Dry Scalp? A dry scalp can be a cause of embarrassment for anyone, regardless of their hair style. However, when you are bald, a dry scalp can be even more noticeable as there is no hair to camouflage the condition. This makes it even more important to look after your dry scalp if you are in this situation. Fact: 97% of Americans will experience dandruff or a dry scalp at some point in their lives. Fortunately, there are plenty of options available. They all tend to focus on general maintenance of your scalp. After all, we moisturize and look after the skin on the rest of our bodies – so why should our heads be any different? Dandruff – or as it’s less commonly known, seborrheic dermatitis or seborrhea. Scalp psoriasis causes redness, itching and flaky skin on the scalp, like other forms can affect other parts of the body. Eczema is another condition that can cause a dry scalp as well as itchy or flaky skin elsewhere on the body. Shampooing your hair too often (such as every day) over an extended period can cause dandruff. Poor diet has been linked to a dry scalp, although no single nutrient deficiency has been identified as the main culprit. It’s known that stress can cause a dry scalp and a variety of other health issues. The weather can affect your scalp just as it can cause havoc with the skin on the rest of your body. It is no secret that in the colder months our skin can dry out significantly. Unfortunately, this means that low temperatures can cause a dry scalp. The same could be said for the summer months if you aren’t careful. Sunburn will quickly dry out and damage your skin without adequate protection – and bald heads are an easy target for the sun. So if you forget to wear a hat or apply cream to your scalp, you can be left red, blistered and peeling. 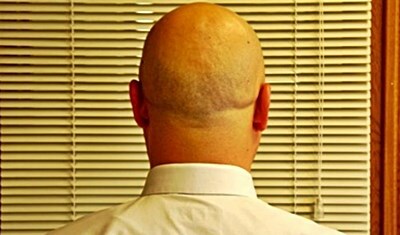 There are ways to keep your scalp healthy when you are bald or have a shaved head. These maintenance tips can prevent dandruff and a dry scalp – so they shouldn’t be overlooked. Keep your head sheltered from the sun. Just as UV rays can burn the skin on your neck and shoulders, it can be equally damaging to your scalp. So don’t forget a hat or your sunscreen. Using shampoo regularly – it is designed to improve your scalp health as well as your hair. See the below section for more information. Stay hydrated – drink plenty of water and use a moisturizing cream designed for sensitive skin or the scalp area. Two popular moisturizers are tea tree oil and argan oil. Give yourself a scalp massage (or have a partner or masseuse do it for you). A massage will encourage increased blood flow and promote good scalp health. Exfoliate your scalp. This can be beneficial if you choose to shave your head regularly (rather than being naturally bald). Although it may initially seem pointless, experts recommend that even people with shaved heads use shampoo regularly. There are tiny hairs even on shaved heads which need maintenance like any other hair – even if they’re difficult to see. The best way to keep them clean and healthy is to use a good shampoo. Failure to do so can mean a build-up of dead cells and dirt above the skin. And of course, both of these are the basis of a dry scalp. So make sure to use a small amount of shampoo on your head several times a week. Some people believe that a simple wash with soap is effective. However, most soaps can have a drying effect – making your dry scalp worse. You should use a high-quality shampoo and follow up with a conditioner to keep the skin hydrated. The top treatment for a dry scalp varies from person to person. What works for some people won’t necessarily work for others. The best way to care for your shaved head is trial and error – see what works best for you personally. Washing and shampooing your head regularly will prevent a dry scalp. Protecting your scalp from the elements and particularly hot or cold weather will also help. Finally, exfoliation and regular massages can help to keep your scalp healthy and in good condition.